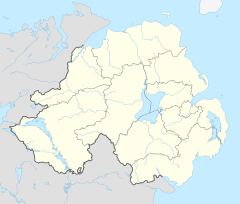 Tattyreagh (from Irish: An Táite Riabhach meaning "the striped/tabby field") is a small townland near Seskinore in County Tyrone, Northern Ireland, and is situated within Omagh District Council area. Over the past 5 years, rapid growth has emerged in this small rural community with new private housing. It consists of mainly residential houses and farms, one RC school- Sacred Heart PS, Tattyreagh St. Patrick's Gaelic Athletic Association club,Darcy Park, and a public house. Cutting through the area is one main road leading from Omagh to Fintona. This page was last edited on 13 November 2017, at 23:43 (UTC).